Meet DJ Mza at the RENDEZVOUS! on Wednesday, June 2nd! 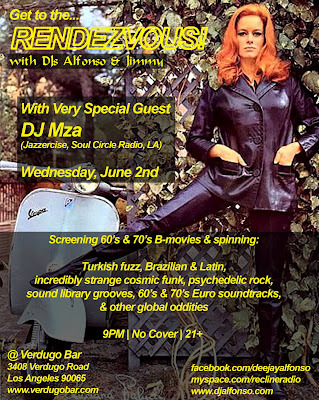 Join us on Wednesday, June 2nd as our very special guest, DJ Mza (Jazzercise, Soul Circle Radio, LA) will be dropping an exclusive ALL 45's set! Expect to be taken on a musical quest filled with soulful global sounds - old stuff, new stuff, good stuff! Your illegal resident aliens will no doubt be hijacking the decks from time to time to ruin the vibe with their mind-bending selections of Turkish & Persian protest pop, psychedelia, space-age cosmic weirdness, Euro soundtracks, and carelessly crafted re-edits. We will also be screening two classic Euro b-movies: police crime caper “Revolver” (Italy, 1972) & French spy thriller “Furia A Bahia Pour OSS 117” (1965). Only 100 copies worldwide! Pick it up at Movie Grooves!